Agra had been known for ages for the Taj, Fatehpur Sikri, the Red Fort and Akbar’s Tomb at Sikandra. How many of us are aware of some of the other monuments in and around Agra forgotten by people. Inspite of restoration initiatives taken by the ASI, these monuments had remained away from the focus of limelight and public attention. 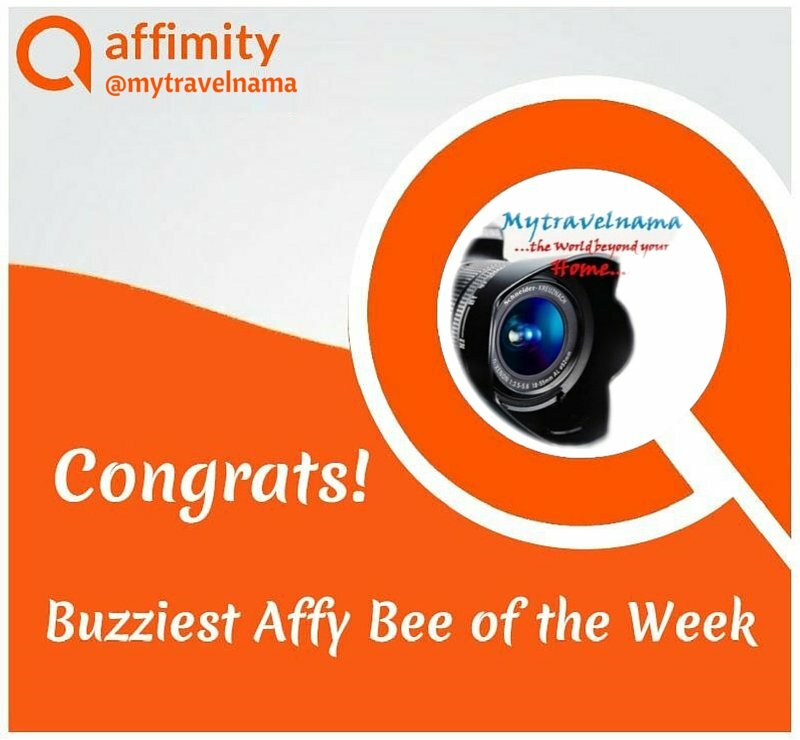 Today we are going to narrate our travelogue of some of these nearly forgotten monuments in Agra. 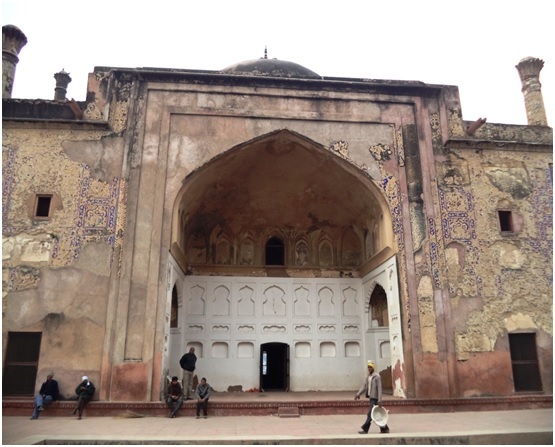 Our first point, post lunch tour was the tomb and the mosque of Diwanji Begum. 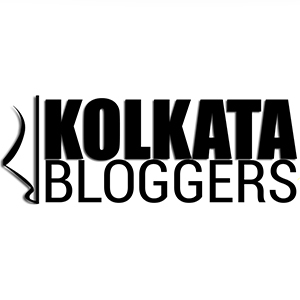 It is located at the Billochpur locality of Tajganj. Diwanji Begum was daughter of Ghias-ud-Din and wife of Asif Khan and mother of empress Mumtaz Mahal. 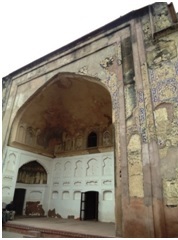 To our dismay and disappointment we found that the tomb was in a ruined condition, although the Archaeological Survey of India (ASI) had initiated restoration process in some areas of the mosque. 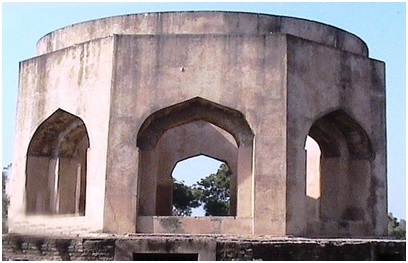 The mosque mansion was made of red sandstone standing on an elevated rectangular platform with three domes located at its apex. The architectural design of the mosque and the tomb bear evidence of the Mughal architectural patterns peculiar during the reign of emperor Shah Jahan. Our car proceeded towards the Katra Wazir Khan market area which was less than a kilometre away from the parking space of Itimad-ud-daulah. 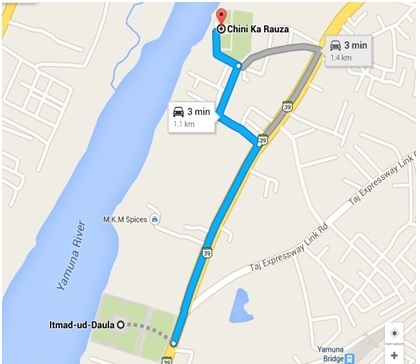 We took a left turn moving through a narrow lane taking us towards the Yamuna riverside. Crossing a very narrow bend we could see the near to be ruined monument standing majestically on the side of the river. Chini Ka Rauza is the tomb of the famous Persian scholar and poet, Afzal Khan Aalmi, who was also the Prime Minister under the rule of emperor Shah Jahan. Afzal Khan Aalmi received the title of “Maula Shukrullah Shirazi”. His tomb was built in the year 1635. It is located about 1km north of the tomb of Itimad-ud-Daulah on the eastern banks of river Yamuna. The tomb once exhibited exquisite use of glazed tiles (Chini) on its walls (thats why its name) which had now worn out with the passage of time. The tomb displays the admixture of traditional Persian and Indian style of architecture in its design and layout. Unlike other tombs, this rectangular tomb is made of brown stone. The walls also contained inscriptions on its polished tiles that we no longer are visible now. 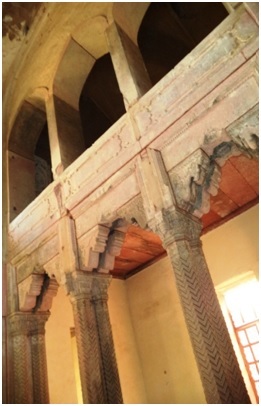 The central chamber is octagonal in shape and adores the sarcophagus of the poet Afzal Khan Aalmi at its centre. The chamber contains a round shaped dome (bearing Afghan style of architecture) overlying the walls which was once brilliantly decorated by paintings and inscriptions from Islamic texts. The beautiful garden surrounding the tomb did not have the traditional Mughal “Charbagh” design that we had seen in most other tombs located in and around Agra. 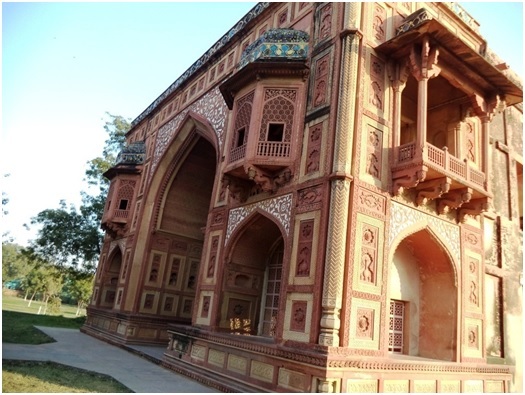 Although Chini Ka Rauza is one of the forgotten monuments of Agra, very recently the Archaeological Survey of India had taken up restoration projects for the preservation of this historic monument. 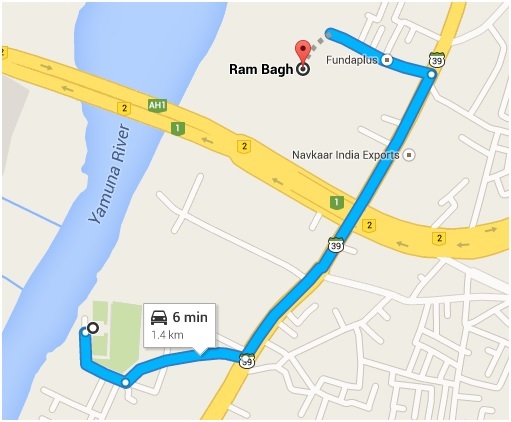 Our tourist cab crossed the NH 2 and after moving a yard or two, we found the famous Araam bagh on our left. To our surprise there was a marked improvement in the weather conditions, there was a glimpse of the sun from the now receding fog cover. Araam Bagh, commonly known as Ram Bagh, is one of the oldest Mughal gardens in India, built by emperor Babur in the year 1528 about 1.5km from the tomb of Itimad-ud-Daulah located on the eastern banks of the Yamuna river. The Yamuna face of the garden is exquisitely royal in ambience and is one of the most loved places in the entire garden. The Yamuna view during the sunset alongwith the bordering trees create a long lasting impact on any tourist visiting the garden. Araam Bagh may not be exactly the typical “Charbagh” garden that we find at Agra. But it follows the Persian garden style having waterways and stoned pathways criss-crossing the entire garden into rectangular plots. The speciality in the design of the waterways used at Araam Bagh can catch the attention of any visitor. The aqueducts or the canals flow down through three levels of terrace into collecting tanks just like a sequence of cascades in a rippling water flow. The garden at its prime time during the Mughal era had a majestic aura with the collection of rare samples of flora and fauna brought by the emperor Babur from far middle east including his homeland Ferghana, the Timurine capital Samarkhand, and Afganistan. 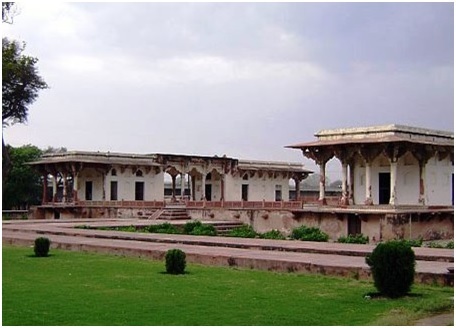 The garden was used by Jahangir as his waiting place before he entered the city of Agra after his victory of the Kangra Fort (located in the modern Himachal Pradesh) in the year 1621 (Ebba. K., 2009). Babur had possibly built this garden with the idea of creating a “Paradise on land”. This garden was mainly used as a place for relaxation for the emperor and his royal family members. This is why it has been named as “Araam Bagh” meaning the “garden of rest”. The garden had also been named as Bagh-e-Noor Afshan, meaning the garden scattering light from its watery pools and aqueducts. The mention of Araam Bagh could be found recorded in emperor Jahangir’s royal chronicle commonly known as the “Tuzuk-e-Jahangiri”. 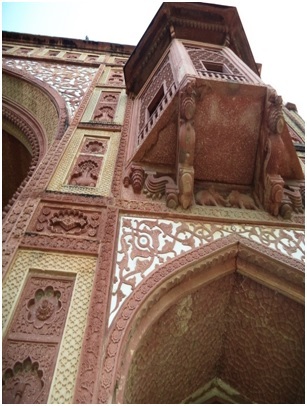 The present architectural designs in and around the garden in the form of the magnificent walls having corner towers crowned by “Chhatris” reveal the use of red sandstone work featuring the architectural patterns of Mughal monuments built during Jahangir’s time. It is said that during emperor Jahangir’s rule, empress Noor Jahan took the initiative for enhancing the beautification of the garden. The north-eastern part of the garden harbours the royal hammam or the royal bathing pool. The present ruined condition of the hammam had a pathetic look and needed immediate restoration care from the concerned authorities. The hammam probably contained separate rooms for the royal women and the men. 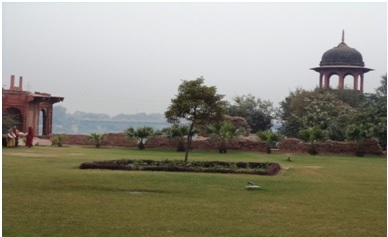 The northern end of the garden contained ruins of a number of medium size red-sandstone buildings which were probably used as guest house for the royal family and the Mughal nobility. Kanch Mahal is a beautiful royal shikargah (Hunting Lodge) built by emperor Jahangir in the year 1605 to 1619 during his hunting expeditions in and around the jungles at Sikandra. It is believed that this building was probably also used as a resort and guest house for the queens and ladies from the royal family. The mansion is surrounded by a charbagh garden now containing remnants of ancient fountains, waterways and paved pathways dividing the garden into four compartments. The mansion is squarish in shape and the present state found at the site after restoration works done by the Archaeological Survey of India is just a shadow of its past glory. The Kanch mahal is a two storeyed mansion made by red sandstone bearing the features of Indo-Islamic architectural features and designs. The arched entrance of the mansion leads to a large central hall with a vaulted soffit rooftop. The hall is beautifully decorated by double octagonal pillars holding the overlying balcony of the first floor. The mansion consists of four square rooms located at its four corners with two openings for ventilation. The building’s exterior was once beautifully decorated by small colourful (blue, green and orange) glazed tiles and glass pieces over its red sandstone base, for which it might have adored the name of “Kanch Mahal”, meaning the glass palace or glass mansion. The remnants of such works can partially be seen at the main entrance over the jharokhas located at the first floor. 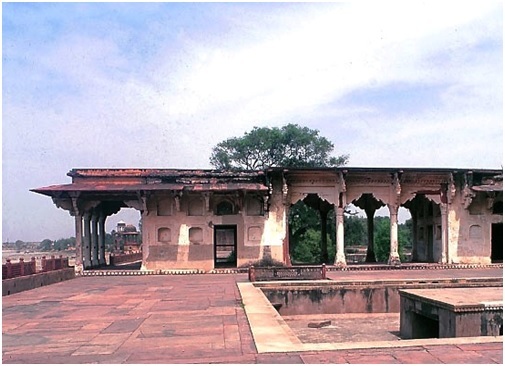 The jharokhas and gaukhs (balconies) of the Kanch Mahal are similar to those used in palaces located in various parts of Rajastan, showing that the emperor had used the admixture of popular Indian and Islamic architecture and designs for building this mansion. The mansion has two identically designed entrances in the north and south. At present the northern facade had remained well preserved compared to that of its southern counterpart. One of the most intricate features of the mansion is the use of exquisite sculpture works on the red sandstone walls both in the exterior as well as the interior. At present, the exterior designs look more glamorous and adorable. These include complex floral designs over the arches (iwans) located at the ground floor, sunkniches containing wine-vases, oval niches containing a full-blown lotus, floral creepers, including complex arabesque and geometrical designs. 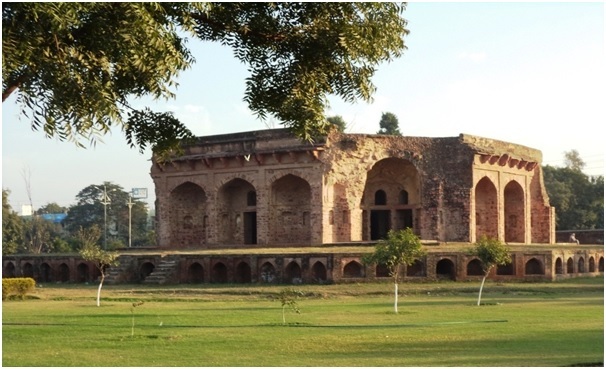 The ruins of a mansion used by Sikander Lodi, Sultan of Delhi, is located to the south of the Kanch Mahal in a lush green garden, now maintained by the Archaeological Survey of India. We called it a day after completing our visit to the Kanch Mahal where the emperor Jahangir used to stay whenever he used to be at Sikandra for paying homage to his father. It was about to be 5.15pm in the evening when we were back to the parking point. Indeed it was a long and enriching day with some of these long forgotten monuments at Agra.